Like most moms, I have to help my kids through normal “separation anxiety” at times. I don’t know any child that is always okay when Dad or Mom has to leave for work or a date (or when they have to leave for school or an activity). Finding ways to help our kids know that we love them, think about them, care for them, and will return is crucial for their well-being. 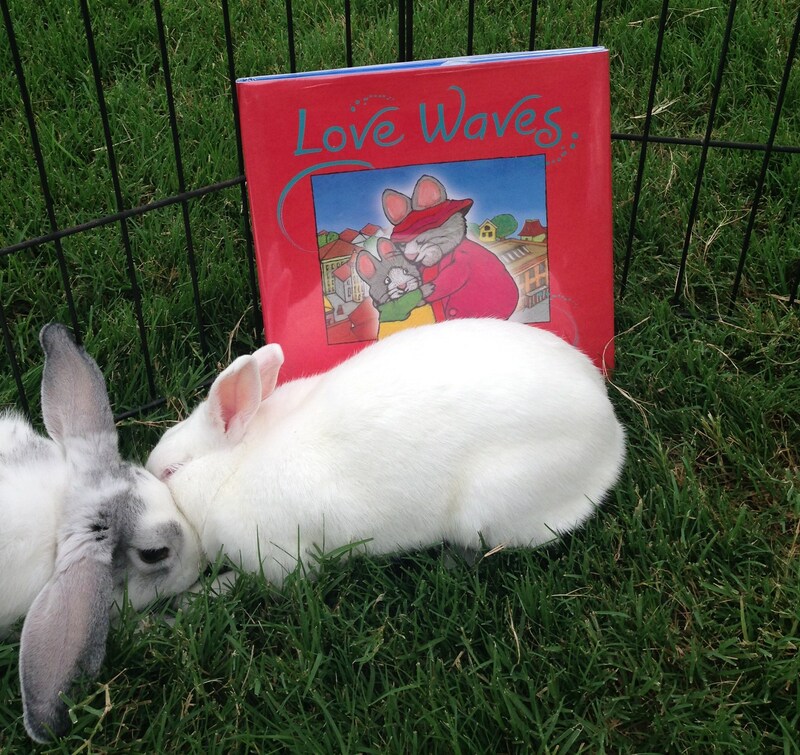 Love Waves is a cute book that communicates all of these positive messages and can prepare kids for those times we cannot be with them. When Mommy and Daddy take turns going to their jobs, Little Bunny misses the parent that needs to be gone for a while. His parents miss him too! While at work, Mommy wonders what he’s doing at home: zooming in his race car, swinging high above the trees, eating honey with his peas? As she thinks of him, she sends “love waves” to him until she can get home. they fly a thousand miles or one. Nothing stops them on their way. When she returns, Daddy goes to work. When he answers his office phone, he hopes it’s Little Bunny calling to tell him what he’s doing: trying to button his shirt, trying to tie his shoe? From his office window, he sends “love waves” over the city to his son. 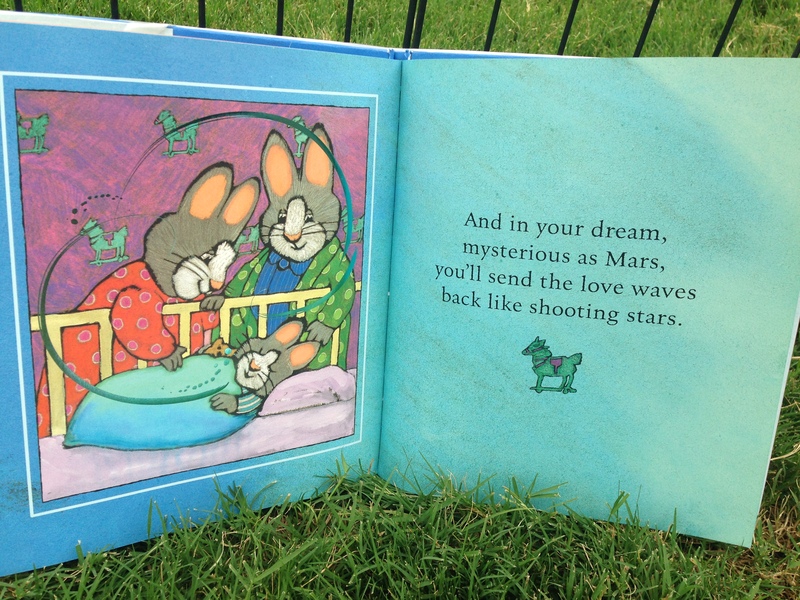 When both Mommy and Daddy are home again and are sitting in their living room together while Little Bunny is tucked snug in his bed, they keep sending their “love waves” to him. 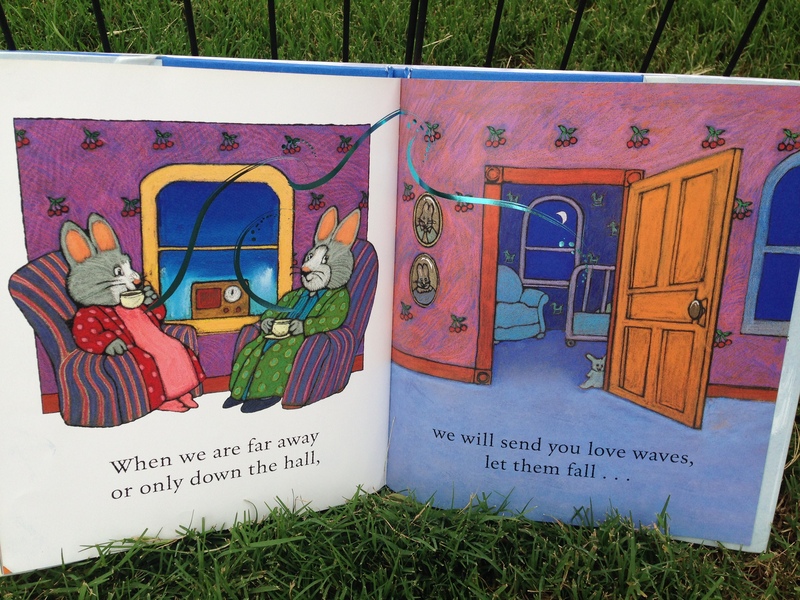 But this time, the “love waves” only have to travel down the hall. F- How do you feel when you have a special babysitter or relative watch you when your Dad or Mom needs to go out? R- Can you relate to feeling happy like Little Bunny when he knows that Dad and Mom are always going to come home to him? I- Can you imagine (picture in your mind) your Dad and Mom at their work place sending you “love waves”. What are they doing when they are thinking about you? Where might they stand when they send “love waves” your way? E- Parents, Let your children explore your workplace by taking them with you one day to see where you are and what you do when you have to be away from them. Tell them what makes you think of them, and show them where you stand when you send “love waves” to them. N- Navigate the trail that the “love waves” travel by talking about it while you drive home from your workplace. For example, maybe the “love waves” go through a tunnel, under a bridge, or attach themselves to an airplane to fly above the traffic. D- Parents, Develop a list or pictures of when you think about your children while working and what messages you want to send them. Maybe write or draw each message separately on post-it-notes (or laminated cardstock) and put them around the house with each child’s name on the cards so they can feel loved everywhere they go! S- Share this story with your children before leaving for work or a date night OR before THEY have to leave YOU to go to school, camp, or their other activities! In early childhood, crying, tantrums, or clinginess are healthy reactions to separation. Separation anxiety can begin before a child’s first birthday, and may pop up again or last until a child is four years old, but both the intensity level and timing of separation anxiety vary tremendously from child to child. A little worry over leaving mom or dad is normal, even when your child is older. You can ease your child’s separation anxiety by staying patient and consistent, and by gently but firmly setting limits. Some kids, however, experience separation anxiety that doesn’t go away, even with a parent’s best efforts. These children experience a continuation or reoccurrence of intense separation anxiety during their elementary school years or beyond. If separation anxiety is excessive enough to interfere with normal activities like school and friendships, and lasts for months rather than days, it may be a sign of a larger problem: separation anxiety disorder. For children with normal separation anxiety, there are steps you can take to make the process of separation anxiety easier. Practice separation. Leave your child with a caregiver for brief periods and short distances at first. Schedule separations after naps or feedings. Babies are more susceptible to separation anxiety when they’re tired or hungry. Develop a “goodbye” ritual. Rituals are reassuring and can be as simple as a special wave through the window or a goodbye kiss. Keep familiar surroundings when possible and make new surroundings familiar. Have the sitter come to your house. When your child is away from home, let him or her bring a familiar object. Have a consistent primary caregiver. If you hire a caregiver, try to keep him or her on the job. Leave without fanfare. Tell your child you are leaving and that you will return, then go—don’t stall. Minimize scary television. Your child is less likely to be fearful if the shows you watch are not frightening. Try not to give in. Reassure your child that he or she will be just fine—setting limits will help the adjustment to separation. Child psychiatrists, child psychologists, or pediatric neurologists can diagnose and treat separation anxiety disorder. These trained clinicians integrate information from home, school, and at least one clinical visit in order to make a diagnosis. Keep in mind that children with separation anxiety disorder frequently have physical complaints that may need to be medically evaluated. Talk therapy. Talk therapy provides a safe place for your child to express his or her feelings. Having someone to listen empathetically and guide your child toward understanding his or her anxiety can be powerful treatment. Play therapy. The therapeutic use of play is a common and effective way to get kids talking about their feelings. Counseling for the family. Family counseling can help your child counteract the thoughts that fuel his or her anxiety, while you as the parent can help your child learn coping skills. School-based counseling. This can help a child with separation anxiety disorder explore the social, behavioral, and academic demands of school. Medication. Medications may be used to treat severe cases of separation anxiety disorder. It should be used only in conjunction with other therapy. 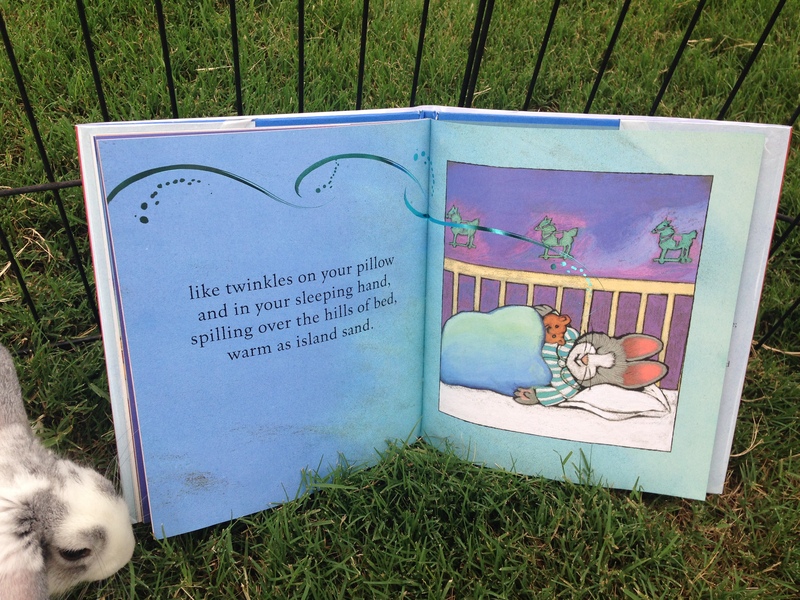 “Like” Kidsbook Friends on Facebook to receive our children’s book reviews with correlating reading activities, crafts, & contests. Subscribe to http://www.kidsbookfriends.com to receive the blog posts directly to your e-mail. 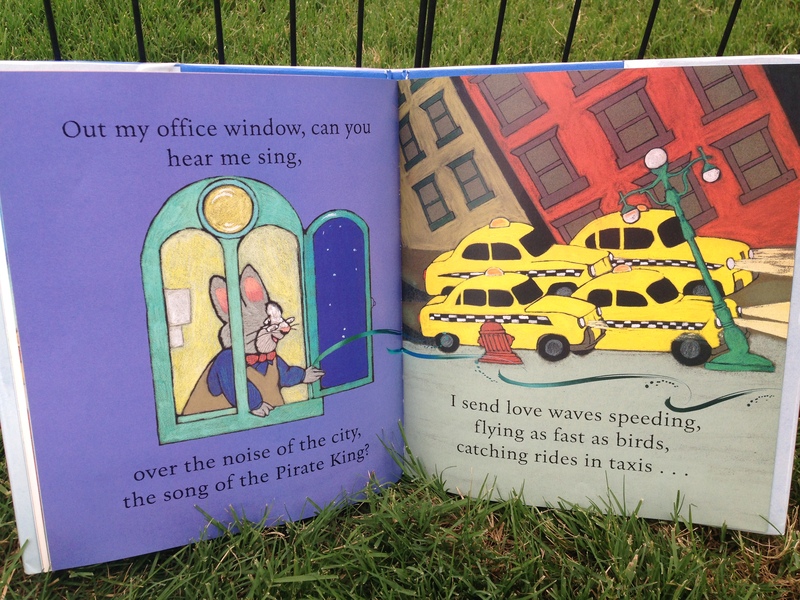 This entry was posted in Rosemary Wells and tagged Candlewick Press, child psychologists, father's love, Love Waves, mother's love, Rosemary Wells, separation anxiety disorder, separation anxiety in children. Bookmark the permalink.